The Economist Magazine is a bear to read each week. But, for me, it is a necessity. Its thoroughness on worldwide politics and business is not approached by any other publications. The digital magazine also comes with word-for-word narration of every article by professional voice-over talent. As a long-distance car commuter, this gives me the ability to actually finish each week's edition. 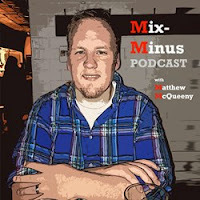 From when the weekly edition is released on Thursday mid-afternoon (Eastern Time), I can listen on my one-hour commute home Thursday, and on Friday's commute to and from work. With a few other reading sessions of the written content, I can typically finish the week's edition by Sunday. This is necessary, because as an oversubscribed newspaper and magazine consumer, I start to get overwhelmed by unread content quickly and want to slay all content-comers in quick order. The little secret between us audio edition listeners is that we never listen at "normal" speed. Maybe it is because the British voice-over talent reading the content is very deliberate and methodical, but it is almost impossible to move through the content and keep interested at regular speed. 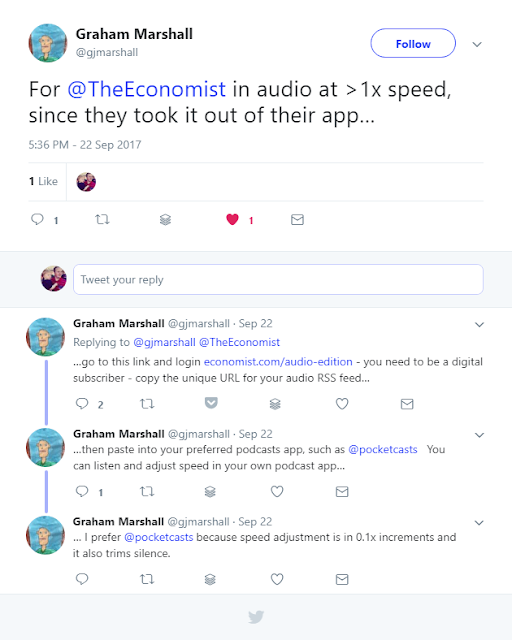 As a regular podcast listener, I don't like speeding-up playback speed in that realm; but, with The Economist, I have literally gotten to the point where I cannot listen at regular speed. It needs to be at 1.5x. 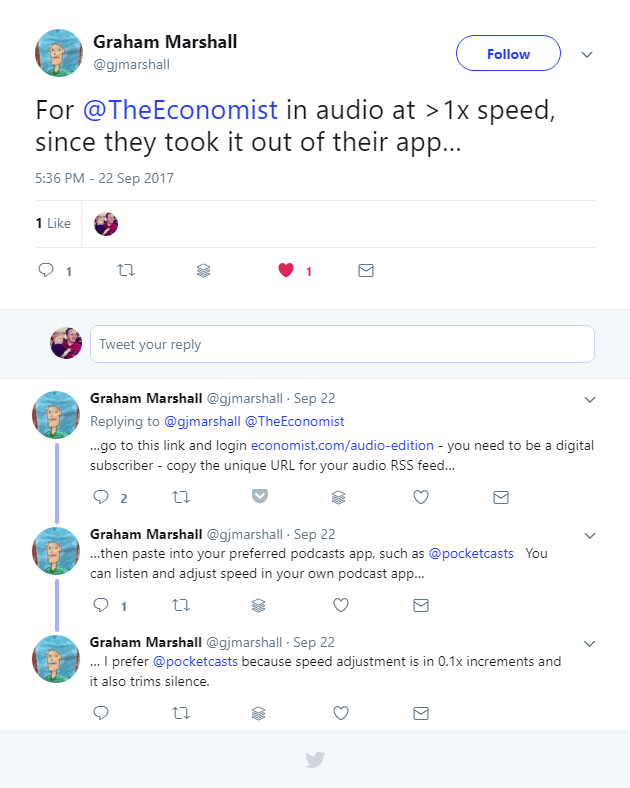 With the release of its new digital apps recently, The Economist still had the faster playback speed options. But, any options beyond normal speed, were very poor in sound quality. I saw users complaining on Twitter and figured I would just live with it until the application product staff made fixes. Then, The Economist came out with an update where they noted the bad quality and simply removed faster playback options. This was brutal. Once you get used to the faster speeds over time, the normal speed actually becomes a problem. All you think about the entire time is how slow it is. And, you don't pick up any of what is being said. It's kind of like how an airplane has to fly at a certain speed to stay in the air. @TheEconomist why in Zeus's name did your new iOS app kill 1.5x and 2x speed? Now like listening to a banana slug read the news. I have been scouring all forums and twitter to find solutions as to when playback speed will return, and for other options in the meantime. Yesterday, I had saw two tweets that show two different ways to keep fast playback. And, the second recommendation might actually solve all problems and be better than The Economist's actual apps. First off, apparently the playback speed button is still there, just hidden. This next option is music to my ears. I use Overcast as my iOS podcast solution. I love its Smart Boost and Smart Speed features. Smart Speed removes natural silence in audio without your noticing it, while giving you many of the benefits of sped-up playback. This gentleman shared this fantastic recommendation on Twitter, allowing The Economist to actually show up in my Overcast. This allows me to speed up playback and benefit from Smart Speed.